New Zealand has a wide range of annual regional rainfalls. Most regions have an annual rainfall of 600–1,600 millimetres per year. Some areas, such as parts of Hawke’s Bay, coastal Canterbury and Central Otago, receive less than this. The south-west coast of the South Island, especially Fiordland, has mountains that trap rainfall from the westerly airstream, and receives 2,000–10,000 millimetres of rain per year. 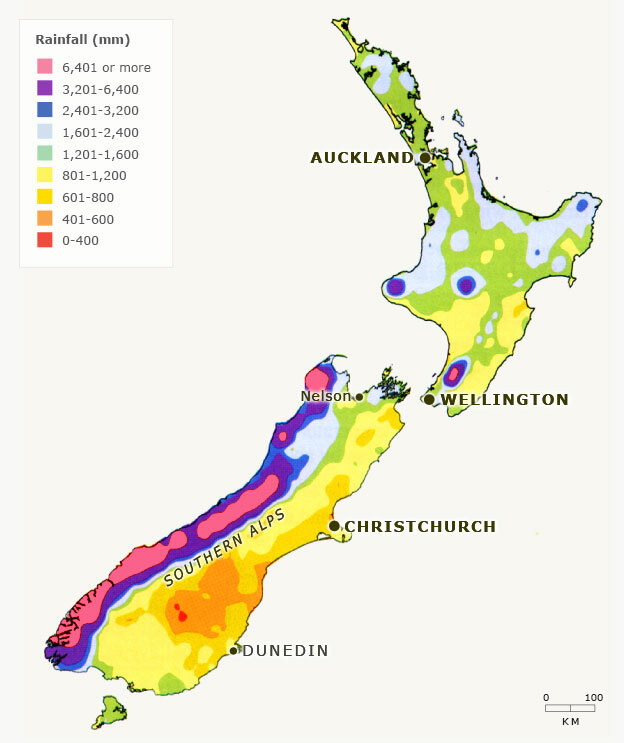 Only the highest mountain areas of the North Island receive a similar amount of rainfall. The highest recorded annual rainfall was over 18,000 millimetres, measured at Cropp River, in the Hokitika catchment on the West Coast.